One Museum Place is a collection of 44 custom residences located at Atlanta’s premiere address, 1301 Peachtree Street, directly across from the High Museum of Art. Construction began in mid-2015 for this 215,000 square foot architectural masterpiece that includes two five-story buildings. Visionary developer John Wieland teamed with Mack Scogin Merrill Elam Architects and General Contractor Brasfield & Gorrie, resulting in one of the most formidable construction alliances imaginable. Just how special is One Museum Place? To begin with, each unit on the top floor has a private rooftop terrace. State-of-the-art outdoor kitchens are located within the lanais, adjacent to the main living levels. Most One Museum Place units have their own elevator, opening directly into their foyers. All have a “private” garage inside the building’s secured parking garage. Clearly, One Museum Place is compatible in scale and texture with its neighbors along the east side of Peachtree Street. At the same time, One Museum Place is compatible in scale and attitude to the High Museum on the west side of Peachtree Street. First introduced as “Midtown Atlanta’s Finest Address,” One Museum Place has certainly lived up to this initial billing. Now that the complex has been built, condominiums have been sold and owners have duly moved in, Midtown Atlanta residents and visitors for the most part, know One Museum Place for its iconic overall design… and its unique exterior cladding. The exterior façade is clad with a combination of materials, with beautiful natural slate being the most prominent. You may ask, “Why slate?” There are many reasons for this. Atlanta-based Mack Scogin Merrill Elam Architects was one of the first American architectural firms to embrace the usage of “rainscreens.” The firm specified its first rainscreen system back in 1989… a time when few people, even architects, knew the wide range of benefits these systems offered. In general terms, a rainscreen is an exterior wall detail where the wall cladding stands off from the moisture-resistant surface of an air barrier applied to the sheathing to create a capillary break, allowing for drainage and evaporation. 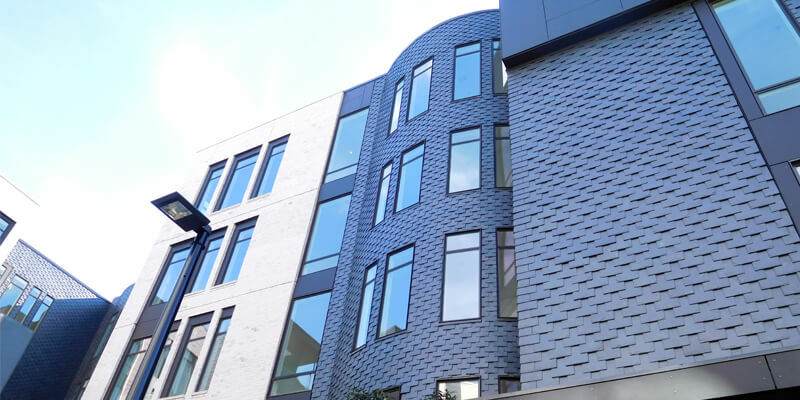 Generally placed on the outside of larger, commercial buildings, the cladding panels can be made from different materials such as aluminum, zinc, copper and stainless steel. In the case of One Museum Place, the architect specified a material that, in their estimation, was to be even better. For centuries, natural slate has performed at optimal levels regarding resistance and durability to any type of weather, anywhere. Natural slate is fireproof, immune to insects, fungus and any kind of microorganisms. Time-tested, it has proven over and over again to be the most long-lasting natural building material. The firm consulted with Vermont Slate during material selection initially and later on during value engineering to discuss color options, cost and availability. 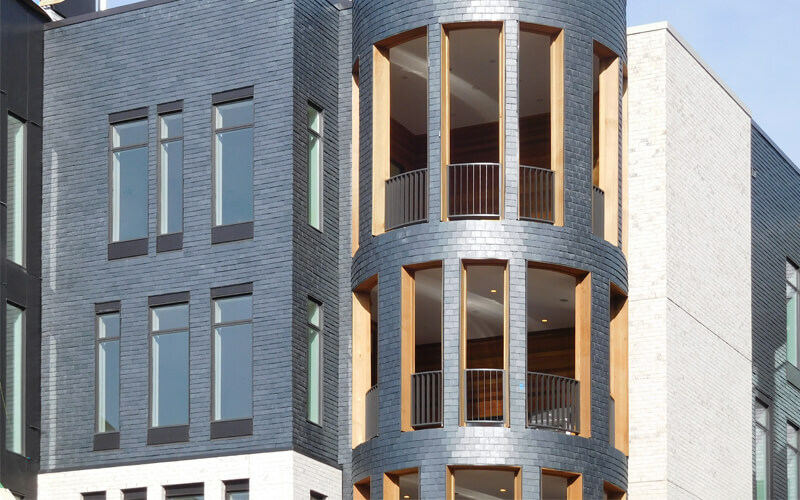 “The architect specified slate roofing in the past, and knew about the attributes of this material,” stated Ken Rule, CEO of Vermont Slate Company, which is the national distributor of CUPACLAD, a rainscreen system developed by the CUPA GROUP. Based in Spain, Cupa Pizarras Slate Company is the world leader within the natural slate roofing and cladding sectors. With 16 quarries in Spain and 22 processing plants equipped with the latest technology, via it’s stateside partner, Vermont Slate Company, the firm has begun focusing on cladding projects… in particular, those within the commercial building arena that call for highest quality rainscreens. “We received drawings from the architect regarding how they wanted to install the rain-screen at One Museum Place. They knew us from providing slate roofing in the past, and were very exacting as to what they were detailing a ‘breathable, waterproof and drainable’ rainscreen. The entire process was efficient, very professionally handled. It was great to work with open-minded, forward-thinking people, as were those at the firm,” added Rule. Natural slate used as cladding can be installed… and, literally left alone for decades upon decades. “It needs zero maintenance,” Rule exclaimed. “A century after being installed, it will continue to perform and maintain its original look. Rainscreen systems help walls manage moisture. The gap between the cladding and building helps to dry the inside vertical wall, which may accumulate a great deal of moisture, particularly during cold weather. Additionally, rainscreens aid in keeping the siding dry, when it becomes soaked by rain or intense humidity. Just imagine how efficient… and, how attractive, any rainscreen could be if the cladding was specified to consist of the most time-tested, 100% natural material on this planet? Clearly, slate is great!